I love natural food and supplement products so when I first heard about natural daylight lamps, of course, I was interested! Being that I am a science major, I was immediately curious about the science behind natural led lighting and what made it a healthy lighting option. 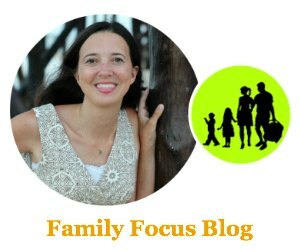 I was impressed by what I learned and eager to see the difference for myself. 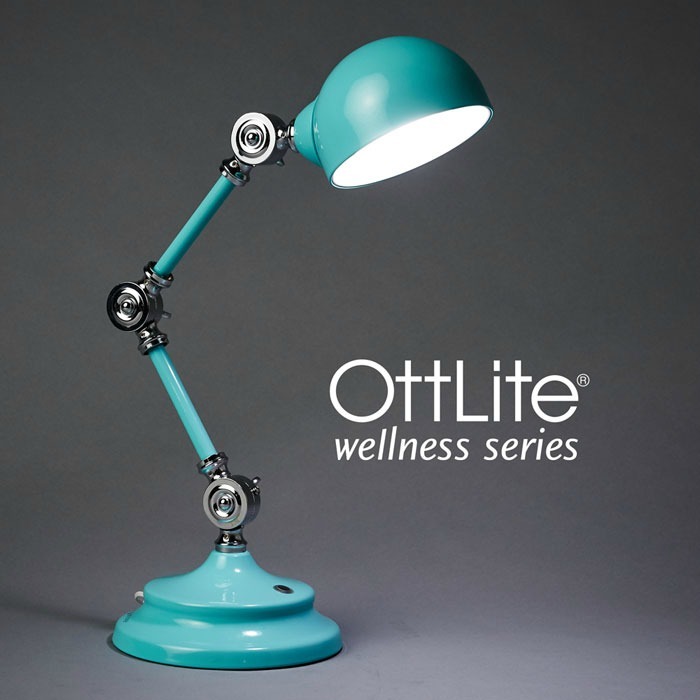 I was therefore happy to do a review for OTTLITE WELLNESS SERIES® natural daylight lamps, especially when I was their cute turquoise desk lamps! OttLite did provide the lamps to facilitate review and they will provide a lamp for giveaway to one lucky reader as well. Did you know 3 out of 4 people suffer from eyestrain every day? Itchy, burning, fatigued eyes are key indicators that we are not using lighting that is healthy for our eyes. That’s why OttLite developed the new and exclusive OttLite ClearSun LED that reduces eyestrain by 51%. The ClearSun LED patent pending technology is the first of its kind and only available in the OttLite Wellness Series®. This revolutionary LED formulation provides light that is closer to the sun’s natural spectrum than any other LED light available– reducing eyestrain and delivering advanced color rendering. OttLite natural daylight lamps are healthier for your eyes because they have a more balanced spectrum of color that’s easier on your eyes. ClearSun LED Technology is as close to the spectral output of the sun as you can get. But that is not all. Natural daylight lamps aren’t just easier for your eyes they also provide “The Best Color Accuracy on the Market”. Now as a blogger who does a lot of photography, I can tell you that is something I love. You can immediately call to mind how this works when you think of yellowed, darker lighting, or even bright washed out lighting in photos verses a photo with more natural lighting that shows vibrant true to life colors. No other LED shows color as true as OttLite Wellness Series® natural daylight lamps. Now that is huge to me. 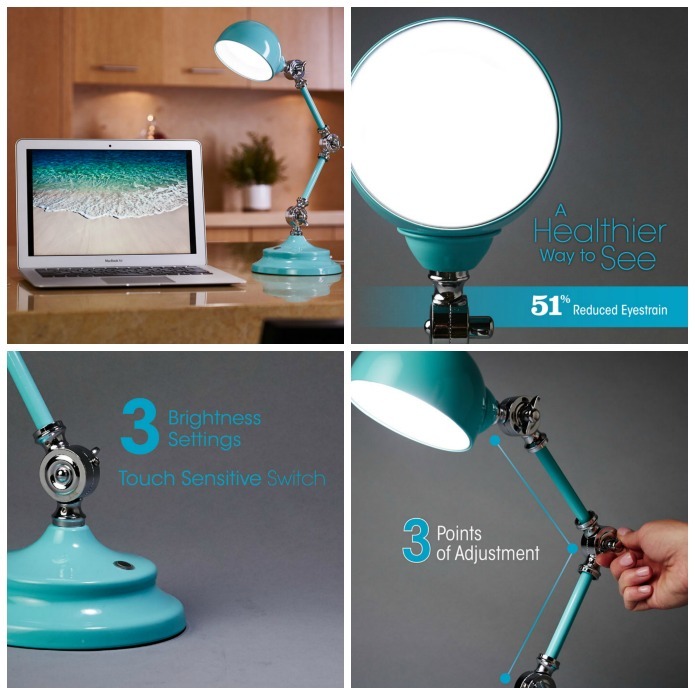 What drew me to chose this OttLite Revive LED Turquoise Desk Lamp was its super cute color and design. 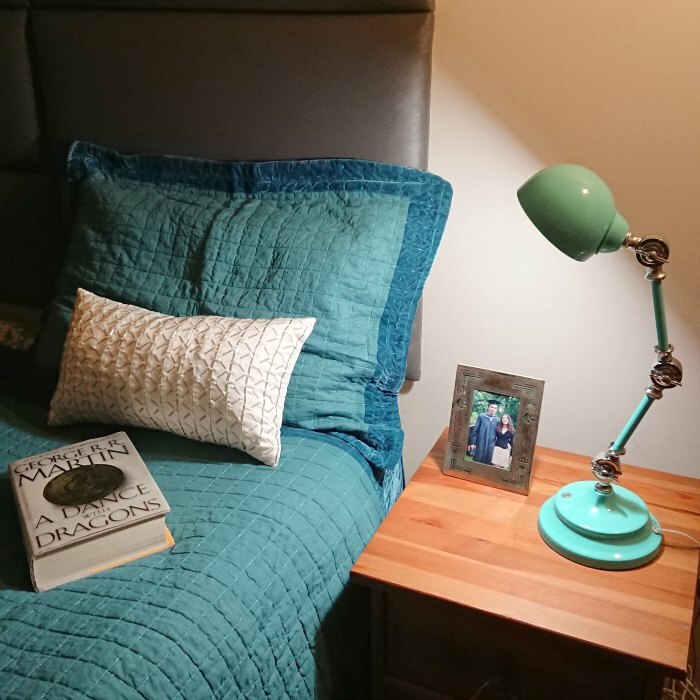 I just love the modern retro feel of these adorable natural daylight lamps and thought they would go well with my new soft cotton teal quilt set from Latest Bedding. The rounded diffuser mimics the look of traditional bulbs. I also couldn’t wait to try out the natural led lighting in person and see how the ClearSun LED Technology felt. I totally dig the more natural lighting- it feels less yellow and dark and more bright and sunny. This is something I will particularly appreciate over this winter and fall when I struggle with all the lack of sunshine! I also find that I can read longer without my eyes starting to feel uncomfortable. I also like that OttLite is committed to quality and they stand behind their products with dedicated, US-based customer service and a 2 year warranty on their lamps. They even offer free ground shipping on orders over $50 to addresses within the contiguous U.S.A. Visit ottlite.com to browse their selection of natural LED lighting. Open to residents of the USA, 18+. Email entered into the widget will be kept private. Winners announced above in the Gleam widget on December 1, 2018. Winner will be selected randomly. I will notify by email and winner must respond within 4 days or the prize will be forfeited and alternate winner will be chosen. Are you looking for healthy home lighting to add to your home decor? Which OttLite natural daylight lamps are your favorite style? Are you eager to try natural LED lighting in order to lessen your eye strain? I love the looks of this lamp! Usually they look so utilitarian and this one has fun style!